Disney&apos;s California Food and Wine Festival returns to Disney&apos;s California Adventure from April 24 – June 7 with a World Celebration theme. This year&apos;s Festival features an expanded schedule with over 600 complimentary and signature events scheduled. There are also new venues, new events, and a larger selection of Festival food and wine offerings. Every … Continue reading "What’s New/Touring Tips Disney’s California Food and Wine Festival Disney’s California Adventure"
Schedule is subject to change without notice. Visit the Festival Welcome Center for the most current information. Complimentary events are included with admission to Disney&apos;s California Adventure. Seating is limited, and available on a first come, first serve basis. Guests must be 21 years of age or older to attend the wine, beer, and spirits … Continue reading "Disney’s California Food and Wine Festival Complimentary Event Schedule"
Banner on Golden Gate Bridge Festival Banner The Art of Flavor Banner Festival Program The Jammin&apos; Chefs Food and Menu Items Lucky Fortune Cookery Festival Menu Taste of California Marketplace Menu Canadian Cheddar Cheese Soup in Mini Sourdough Boule Beer Battered Halibut Mucho Gusto Quesadilla Marketplace Slider Santa Rosa Pear Salad Island Ahi Ghirardelli Chocolate … Continue reading "2010 Photo Gallery Disney’s California Food and Wine Festival Disney’s California Adventure"
Disney&apos;s California Food and Wine Festival returns to Disney&apos;s California Adventure from April 16 – May 31 with the theme The Art of Flavor. This year&apos;s Festival features new venues, new Signature Events, and a larger selection of food and wine offerings. Every day park visitors can attend complimentary cooking demonstrations, many of them featuring … Continue reading "What’s New/Touring Tips Disney’s California Food and Wine Festival Disney’s California Adventure"
Dates for 2008: April 11-May 5 2008 Schedule of Events Festival Menus We want to hear from You! Please submit your Experiences! 2008 Dates: Daily April 11 – May 5 Disney&apos;s California Food and Wine Festival will be held April 11-May 5 at Disney&apos;s California Adventure park. Festival events include cooking schools, winemaker dinners, cooking … Continue reading "Disney’s California Food and Wine Festival Disney’s California Adventure"
Disney&apos;s California Food and Wine Festival has returned to Disney&apos;s California Adventure this year, with an expanded schedule and a number of changes. The Festival now has events daily from April 11-May 5, rather than only on weekends as in the previous two years. There are also new venues, new events, and a larger selection … Continue reading "What’s New/Touring Tips Disney’s California Food and Wine Festival Disney’s California Adventure"
BV = Bountiful Valley Farm LP = Golden Vine Winery – Lower Patio PW = Pacific Wharf Demonstration Kitchen PWS = Pacific Wharf Stage Complimentary events are included with admission to Disney&apos;s California Adventure. Seating is limited, and available on a first come, first serve basis. Guests must be 21 years of age or older … Continue reading "Disney’s California Food and Wine Festival Complimentary Event Schedule"
The Disney Parks Blog announced that the California Adventure Food and Wine Festival will return (finally) weekends in April, 2016. 2007 Silverado VineyardsWinemaker Dinner Review Review of "Taste" What&apos;s New and Touring Tips 2007 Review 2007 First Hand Reports! 2007 Schedule of Events We want to hear from You! Please submit your Experiences! 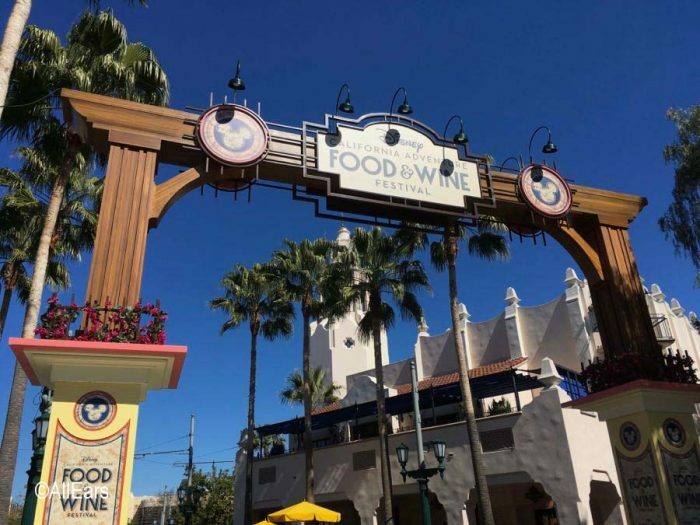 2007 Dates: April 27-29, May 4-6, May 11-13, May 18-20 Disney&apos;s California Food and Wine Weekends take place on Friday, Saturday, and … Continue reading "Disney’s California Food and Wine Weekends Disney’s California Adventure"
Disney Springs West Side opened in 1997 as Downtown Disney West Side. It is the home to Bongos Cuban Cafe, Splitsville, the AMC-24 Theater and more. The West Side is the largest of the Disney Springs areas and includes 344,000 square feet of buildings and a 9,500-square-foot area for events and entertainment. At right is … Continue reading "West Side – Disney Springs"